100 pouches Double Letter (small menu) Size thermal (heat activated) clear gloss laminating pouches. 11-1/2" x 17-1/2" (292mm x 445mm) with 5 mils (125 microns) per flap and sealed on one 11-1/2" edge. 100 pouches per box package includes at least 1 silicone coated carrier. Mini-Letter size allows a 1/4" laminate border around your standard 11" x 17" sheet of paper. Pouches have standard 1/8" radius rounded corners. Quality meets or exceeds all major brands, but at generic pricing. Maximum card stock size recommended for this pouch is 11-1/4" x 17-1/4" (or less) to leave a standard 1/8" border of clear laminate around all sides of card for a secure sealed edge. TIPS: Industry standard specification for 5 mil laminating pouches is 5 mils on each flap for a total of 10 mils added to your paper sheet. Also, 1 mil equals 1/1000th of an inch (or 25 microns metric). The industry calls these laminating pouches when they are sealed on only one edge instead of three like folders. 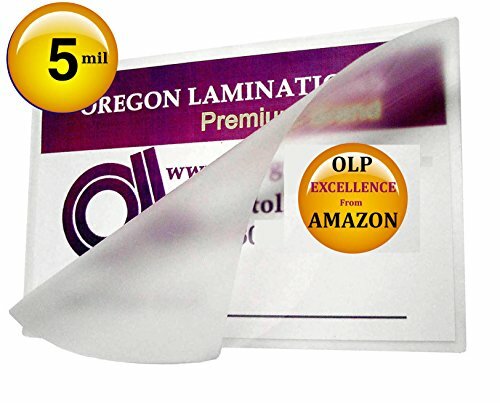 Insist on Authentic Oregon Lamination Premium Laminating Pouches. You'll be glad you did. If you have any questions about this product by Oregon Lamination Premium, contact us by completing and submitting the form below. If you are looking for a specif part number, please include it with your message.